Plants vs Zombies XBLA Release Party! 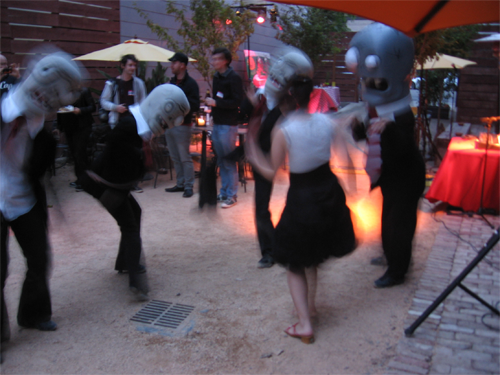 So for those of you who were wondering what the August 2nd “save the date” was all about, PopCap held a Plants vs Zombies XBLA Release Party in San Francisco on that day and it was a blast! I tried to take as many pictures as I could (I’ll post some here, but if you want to see the entire batch, you can find them here). George and I also performed “Zombies on Your Lawn,” which you can watch here. I was a little nervous at first, but I hope it’s still alright! There were 3 areas at the venue: The main courtyard had a makeshift stage and a delicious buffet-style dinner. They also had one of those giant pictures where people could put there heads through it in order to look like Bobsled Zombies. What are these called anyway? I see them all the time at carnivals and amusement parks, but I have no idea what their actual name is. Indoors they set up a gaming station with several large monitors and Xbox consoles so that people could come and try out the new game (some people were glued to their consoles for literally 2.5 hours)… there were benches and folks could hang out here to warm up (since it was really cold outside). The last area was a small covered space between the courtyard and game station… there was a bar here where you could order PvZ-themed drinks like “Fermented Plant Matter” or Crazy Dave’s special “Zombie” drink. The PvZ artist (Rich Werner) also had a table set up where he drew personalized plants and zombies for people. As for the game itself, I really think they did a great job with the conversion. At first I had no idea how the control scheme would work; going from the mouse to the iPhone or iPad was a simple transition, but I figured mapping controls to an Xbox controller would be a much bigger challenge. Basically, the player uses the analog stick to move the cursor around. Rather than clicking on sun, you roll the cursor over the sun in order to pick it up. Pressing the R-trigger will magnetize the sunshine allowing it to be automatically collected. You can use the right and left bumpers in order to scroll through the seed packets, and you press A to select them. It’s surprisingly intuitive and easy to pick up. By far my favorite part of this version is the “versus mode.” You can play as either the plants or the zombies. The zombies’ goal is the same as in the original game: you want to break through the plant defenses and get to the house. The plants’ goal is to destroy a certain number of gravestone targets, while battling the onslaught of undead that the zombie player sends towards you. While it was still in development, I spent several hours playtesting this mode with George. Despite the fact that the game wasn’t even balanced yet, I could not stop playing because it was so addictive. There’s something incredibly fun about being able to place zombies… especially large ones like the Gargantuar. When I first heard about L.A.R.P. (live action role playing) I was under the impression that it was just a bunch of crazy nerds going out into the woods and throwing fake lightning bolts at each other. I was so amused by this that I even talked George into renting a L.A.R.P. documentary called Monster Camp, which actually ended up being a very entertaining and insightful film. I say “insightful” because the director, through the examples of the people he followed, delved heavily into the concept of escapism. There was a lady who said she larped to escape the reality of being in a wheel chair, a single father who was addicted to World of Warcraft, a software programmer at Xerox, and many others. I was surprised at the wide variety of people who attended these events. 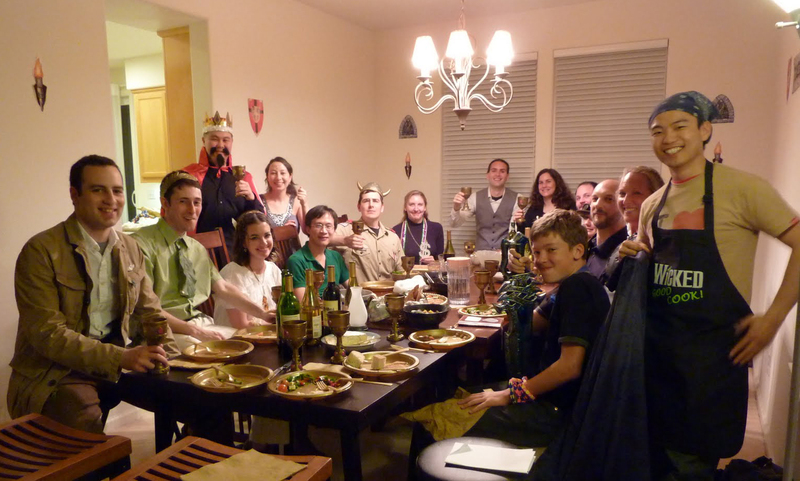 For some of them, larping was just a healthy activity where they could get away for a weekend and hang out with friends… for others, it was just another drug helping them avoid neglected responsibilities in their real lives. The other concept the film touched upon was one that I’d been curious about for quite some time: being able to enjoy make-believe as if you were a kid again. I remember going out into the backyard with my friend and our younger sisters and just playing for hours. I remember we pretended that we lived on an island, and we’d invent various scenarios. One time we said that “bad guys” were going to invade the island and we’d have to prepare traps and other defenses… Another time we decided that winter was coming so we gathered “supplies” and fortified our shelter. We had this tree in our yard that was slowly dying, it was hollow at the top and rainwater collected there. It wasn’t just water though, it had magical powers of restoration that could cure my sister when she got some mysterious island sickness. We didn’t make her drink it of course, but we climbed to the top of the tree just to obtain the water so she could pretend to drink it; after which she was immediately healed. We played this for hours… I even put Megaman 2 on hold so that we could play… and my NES-time was severely limited back then, so that was a BIG DEAL. In middle school, I was talking with my friend Tara who still had a sister in elementary school. At some point we were like, “hey, remember when we used to make stuff up?” We both agreed that it was the most fun thing in the world, and then questioned why we hadn’t done it lately. “Would we still enjoy it?” we wondered… so we went into the yard with her sister and attempted to make up scenarios and play as we did just a few years prior… but it just wasn’t fun anymore. It was a sad realization; for both of us I think. After that, I never had fun playing like that again. I had forgotten how. But after watching Monster Camp it suddenly occurred to me… these people whom I had been imitating in jest, who go out into the woods dressed as elves and mages, throwing lightning bolts and using healing potions… these people remember how. They remember how to have fun playing like we did as kids. And at that point, I became intrigued with live action role playing. I became intrigued with the adults who were actually able to suspend reality in order to relive that fantasy that all children experience and invariably forget once they grow up. So I decided to write a LARP. Well, not a real one… there was no battle system or throwing of lightning bolts… but there was a story with characters who had latent conflicts, a central objective, a giant feast with plastic gold goblets, and a handful of mini-games. Oh, and one of our characters had to pretend that he was raised by bears. As this was the first time I’d ever run an event of this nature, I found that there were definitely some kinks that I’d want to iron out if I ever did this again (especially in terms of how late everyone ended up having to stay awake). But beyond that, I was amazed by how many people came dressed in creative costumes, got into their characters, and seemed to actually have a good time. I don’t think we quite reached the level of “suspending reality” in the way that the people from Monster Camp did, but that’s okay. For now I’m just focused on creating an environment where people can come and have fun, play games, and goof around for a few hours. Perhaps someday though, I will remember. We were all wearing our costumes when we went outside in the middle of the night to do an “Alchemy Relay” that culminated in dropping mentos into diet coke. I think the plastic gold goblets were my favorite part. So a few weeks back George took me to a place called “Vision Quest” for my birthday. It’s basically a big animal reserve; a lot of the animals there had been abused or abandoned at a young age, but were later rescued and brought there to live. There’s also a few animals who have done work for Hollywood, either starring in films or acting as models for animators. I was under the impression that this type of wildcat wouldn’t purr, but she purred just like a domestic cat… only louder… and she continued to purr the entire time we saw her. She kind of went nuts on the grass… she couldn’t stop eating it. All the domestic cats I’ve known have been the same way… my first cat loved eating grass.